I spend a great deal of my life in airports. Part of my job involves working in one several times a week and when I’m not at work, I’m a regular flyer. It’s safe to say that in the last three years, I have spent a great deal of my days in an airport. I’m one who is all for an easy life so I’m usually quick to pick up on any tips or hacks to make things a little more convenient for me. That may be a lazy personality trait but it means that over the years, I’ve picked up a few great tips and hacks that have made my flying experience better. Last night I participated in a blogger chat on Twitter which was all about hand luggage. Other bloggers seemed pretty surprised by one of my luggage tips, questioning why they didn’t know about it or think about it themselves. I know, I know, I must be an absolute genius. You’re right I am so it got me thinking that I would share my wonderous wisdom and knowledge with you guys and help make your own flying experience better. You can thank me later. Well, duh, we know this already! The reason I tell you this though is to avoid you getting overbooked. Airlines will always release more flight tickets than seats available. The reason for this is that there is an average statistic of people who don’t turn up for the flight so it is to avoid them losing out on money/make more money. But what if everyone does turn? There my friend, lies the problem. This rarely happens but it does happens and that is how flights get overbooked. If you check in online, you avoid this risk. Airlines will only overbook the people who haven’t already checked in who they can personally inform at the check in desk. Whilst you can breeze through security fanning yourself with your boarding pass none the wiser, someone is getting held up and has to miss the flight. I’d strongly recommend checking in online if you’re a solo traveller as they are also more likely to overbook solo passengers. On the other hand, if you have a day or two spare and in no rush to get there, you can always risk it. If they’re struggling, they will ask passengers to volunteer to be overbooked and if you do, you’ll receive roughly 400€ in compensation. If you haven’t checked in online, when you arrive at the airport choose the standard check in queue next to the baggage drop off queue. Once that queue is empty, they will start feeding people from the next queue in which means your queue will go down twice as quick. Not a groundbreaking tip but a time saver. Ok, this is a bit of a dodgy one and I can’t vouch that it will work in every airport. When you’re at the desk and putting your luggage on the scales, there is usually a gap between the belt you put your bag on and the actual scale itself. It’s usually easy enough to jam your foot in the gap and relieve some of the weight. Check in desks are also so high for data protection that the staff can’t actually see you do it. Perfect if you think you’re going to be over your luggage allowance. You can’t take liquids over 100ml through security, right? So annoying and then if you want a drink on the other side, you have to pay stupid airport prices. However, you can take empty bottles through security… then you can fill it up the other side and there you go, you’ve still got a free drink for your flight. Perfect option for this would be to buy a plastic flexi water bottle which you can squish down. Barely takes up any room in your suitcase plus, you can buy them from cheapo shops like Poundland and Home Bargains. Low cost, short haul airlines often have more people travelling with cabin luggage than checked luggage. This means that often, there isn’t enough space in the cabin for all of these mini suitcases and some will have to go in the hold. Some airlines, particularly easyJet, will ask you to volunteer to put your luggage in the hold. Few people volunteer because then you have to wait for your luggage to come through baggage reclaim. As volunteer bags will be put on last, they will be first on the baggage carousel. It also means you don’t have to fight for overhead locker space or struggle to lift your heavy bag. Plus, you get speedy boarding as a thank you meaning you can sail straight to your seat. And if you don’t volunteer but are towards the back of the queue, your bag will probably still have to go in the hold but you won’t get the benefit of speedy boarding. How annoying is it that airlines only allow you take one bag in the cabin? I for one want my fully packed cabin case in the overhead locker aswell as my handbag conveniently under the seat in front of me. Unless you fly with RyanAir who have better baggage rules, you will encounter this problem. Enter Ye Olde Duty Free Bag! All hail the duty free bag! Whilst airlines won’t let you take two bags on the plane, they will let you take one bag AND one duty free bag. So get yourself a duty free bag and pop your handbag inside to carry onto the plane. Success, more luggage for you. Plus, you also don’t have the awkward aisle hold up whilst you get every flight essential item out of your case. You can pop your case straight up and slide into your seat with your duty free bag of handbag goodies! 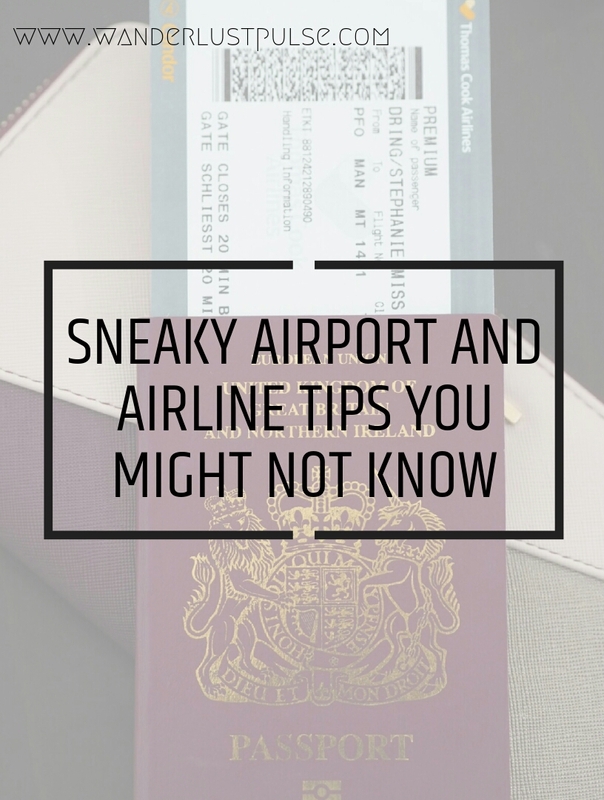 And there you have my airport and airline tips and hacks. Let me know if you have any others! The plastic bottle trip is super clever, I can’t tell you how many times I’ve had to really quickly try and drink my water before going through airport security and it’s so annoying. Love the empty bottle, volunteer luggage and duty-free bag tips! I never even thought about any of this! Thanks for sharing your tips and tricks girl! This was a super useful post, Steph! I didn’t actually know about the little gap between the belt and the scale on the luggage belt, I will definitely be deploying that trick in future if I’m ever worried about the weight of my bag! Taking a plastic water bottle is golden advice as well, I’m a total cheapskate and hate paying crazy airport prices the simple stuff like food and drink!